Before you will be able to test your iOS app or submit it to the app store, you will be required to create a set of certificates. We can setup your certificates for you (free), just email us with a link to your app and your iTunes Connect login and password. Please make sure your account is active and paid, and turn off 2-factor authentication. If you'd like to create certs yourself, keep reading. The requirements are different for debugging and releasing an app, as well as using push notifications. We’ll make as clear as possible in this article. Note: Push notification certificates are covered in depth (with videos) here. Before we get into the step-by-step tutorial, here is a bird’s eye view of the process. 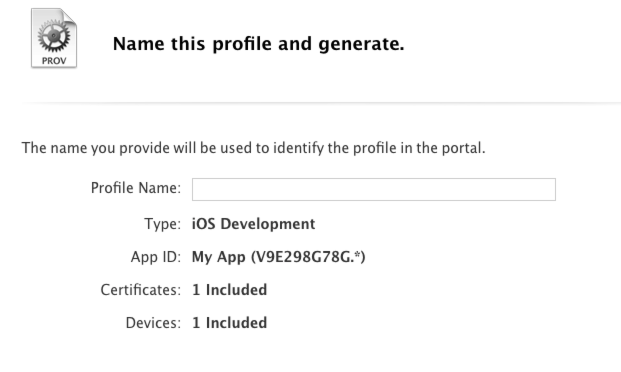 Every app needs an ID, certificate, and a provisioning profile to work on a device or to be added to the app Store. Note: If your app uses push notifications, you will need one additional certificate. We’ll cover that a bit later in this article. Before we proceed, let’s clear up some terminology. As you are going through this process, you will have the option to create Development or Production certificates. The process is virtually identical, other than a couple of checkboxes. A Development certificate is required to test your app on a device before submitting it to the app store. It is only good for testing and cannot be used when submitting your app to the app store. Likewise, Production certificates can not be used for testing. 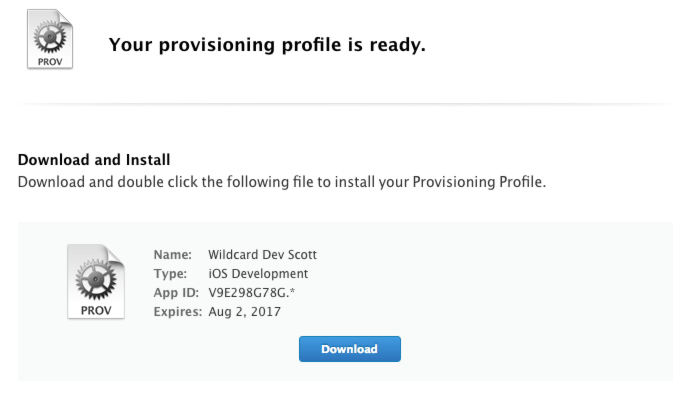 For developing apps, we suggest creating a single Development certificate and provisioning profile using a wildcard app ID. This will allow you to use the same certificate for testing all of your apps. Then, when you’re ready to submit to the app store, you simply create a Production certificate specifically for the app using a unique app ID. If this all sounds Greek to you still, have no fear. We’ll explain as we go along. Let’s get started. In order to test a development build of your app on your device, you have to register your device. If you want to test the app on multiple devices, register them all prior to creating your provisioning profile, otherwise you’ll need to regenerate the provisioning profile and rebuild the app. To start, login to your developer account at developer.apple.com/account. Next, connect your device to your computer with a USB cable and open iTunes. Click on your device icon in the toolbar. Under Summary, you will be shown your phone’s Capacity, Phone Number and Serial Number. Click on the Serial Number and you will then be shown the phone’s UDID. Right-click on the UDID string to copy it to your clipboard. In your browser, click the “Certificates, Identifiers & Profiles” box. On the left nav bar, click Devices -> All. This will show you a list of all the devices you’ve registered so far. If this is your first time here, the list will be blank. Click the button with a plus (+) button in the top-right corner next to where it says “All Devices”. Suggestion: When naming your device, use something identifiable like “John’s iPhone 6 Plus” and “Scott’s iPad Mini”. This way, if you upgrade your devices, you’ll know exactly which devices can be removed safely in the future. Earlier we talked about creating a wildcard app ID that can be used for all apps you develop. We’re going to do that next. Once created, this certificate can be reused, so you only have to do this process once. In your developer account, click on Identifiers -> App IDs. Click the plus button in the top-right corner next to where it says “iOS App IDs”. Give your app ID a description. 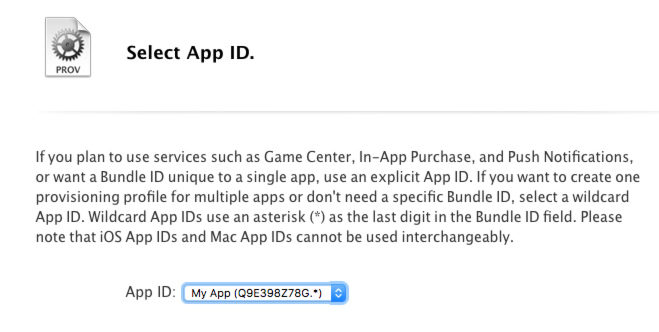 Then, in the App ID Suffix section choose Wildcard App ID and enter an asterisk (*) for the Bundle ID. The rest of the fields can be ignored. Note: push notifications don't work with wildcard app IDs. If you need to test push notifications, you need an explicit app ID. We'll create push certs later in this article. On the left nav bar, click Certificates -> Development. 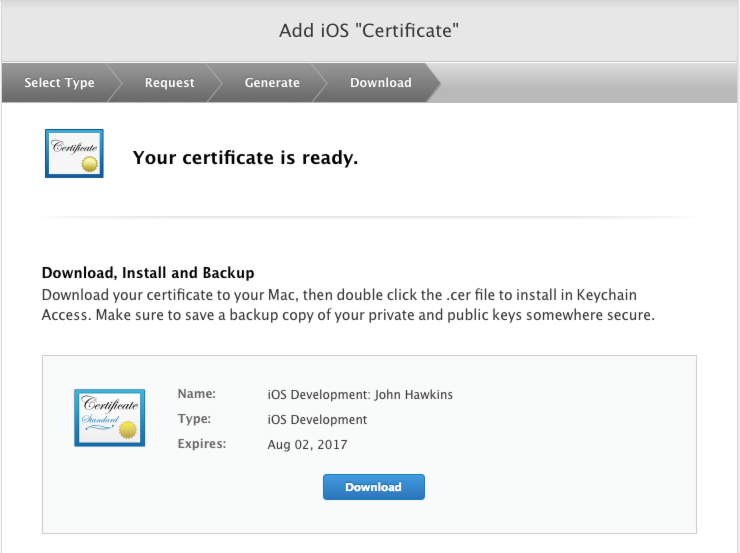 Click the plus button in the top-right corner next to where it says “iOS Certificates (Development)”. In the Development section, select iOS App Development and then click Continue. Once you’ve saved the CSR to your hard drive, click continue in your browser. You will be taken to the Generate your certificate page. Click the “Choose File” button, find the CSR you just created and click continue to generate your certificate. Your certificate is now ready. Click the Download button to save your CSR to your computer. Note about CSRs: You must create new CSR files for each cert. Next you’ll need to export the certificate as a .p12 file. To do that, double-click the certificate you saved to your computer in the previous step. That will open the certificate in the Keychain Access app. Click on My Certificates on the left to view a list of your certificates. Click the grey arrow next to the newly created certificate to reveal your private key. If you do not see an arrow, something went wrong. You either aren’t an authorized developer, or you didn’t generate the right type of certificate and should start the process over. You will be prompted to save the file. Make sure you name it something like dev-yourcertname-certexpirationdate.p12. This will help later on when you have multiple certs. You will also need to create a password. Make sure you keep a record of this password so you can find it later. That's it, you now have your development .p12, which you can use to build your app for testing. The last item we need is a provisioning profile. On the left nav bar, click Provisioning Profiles -> Development. Click the plus button in the top-right corner next to where it says “iOS Provisioning Profiles (Development)”. In the development section, choose “iOS App Development” and click continue. From the dropdown, select the wildcard app ID you created in the previous step and click continue. Select the certificate that was created in the process above and click continue. Select all of the devices where you plan to install the app for testing then click continue. Give your profile a name. Make sure to call it “Wildcard Dev Scott’, or something that tells you exactly what it is at a glance. This will help when you start making other profiles. Your provisioning profile is ready. Download the profile to your computer and you’re ready to go. You can now use this provisioning profile along with the .p12 file you created to build your app on Phonegap Build, or other platforms. Here are some things to keep in mind if you're having trouble. Make sure you've already created your app ID, certificate, and added devices before creating the provisioning profile. 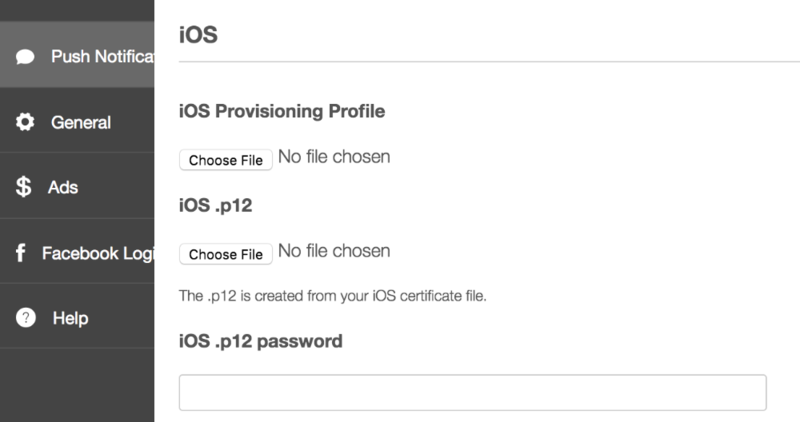 The certificate you choose with the provisioning profile must be the same one as the .p12 you are using. Don't mix up development and production profiles/certs. They have to both be the same, either both dev or both production. The development certificate and profile you just created can be re-used for testing all of your apps. To submit to the app stores (or test push notifications) you will need to create a production certificate with an explicit app ID. If you've already created your development certificate, the production one is easy. It's the same exact process, but we just tweak a couple of things. Everything else is the same, including creating the .p12 and provisioning profile. Go to Identifiers->App IDs, and create a new one by clicking the plus button. This time, choose Explicit App ID, and make up a reverse domain name like com.mycompany.myapp. It's not important what it is, but it's a good idea to use a naming convention like I did. Ignore the other options and save. This is the same exact process as creating a development certificate, except you choose "App Store and Ad Hoc" instead of Development. 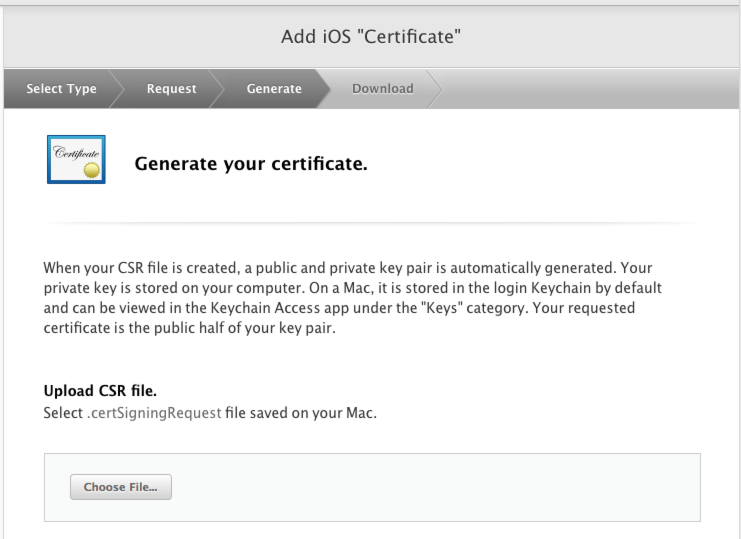 You can use the same Certificate Signing Request you created before, generate and download the certificate. Convert it to a .p12 the same way we did earlier in this article. That's it for your certificate, now we just need an App Store provisioning profile. Under Provisioning Profiles, click Distribution, then click the plus button to add a new one. This process is exactly the same as before, except we choose App Store. Choose the explicit app ID you created above. Then choose the production certificate you created in the last step. You now have your production .p12 and distribution provisioning profile, you can build your app with those 2 things and it's ready to submit to the app store! There's one last thing we need to deal with, and that's an app with push notifications. Push notification certificates are covered in depth (with videos) here. An app built with push notifications has a couple extra requirements. You still need a production .p12 and provisioning profile like we did above, but you also need an extra SSL certificate. Assuming you've already done the steps under Production Certificate above for your app, let's create the SSL certificate. Push notifications require a server that sends a notification to Apple's servers, then Apple sends that notification out to the app. The SSL certificate is converted to a .p12, and then uploaded to myapppresser.com app dashboard under Push Notifications => Notification Profiles. Let's create this certificate now. First, go to your App IDs, and click on your app's ID, then click the Edit button. Scroll down to the box that says Push Notifications. Check the box beside it. Next, under Production SSL Certificate, click Create Certificate. You will be prompted for a Certificate Signing Request, use the same one you created before, then generate the certificate. Download it. Next, double-click the certificate. This should open the Keychain Access utility. Find your certificate (it should show the app id), and right click. Choose "Export." Give it a name and password, this is the file you will upload to myapppresser.com under Push Notifications => Notification Profiles => iOS .p12. Upload the .p12 and enter your password, add the production provisioning profile you created above, then save. To test push notifications, you must build your app with the Ad Hoc certificate we created above. To do that, first login to PhoneGap Build, and add your signing key. This is the .p12 file you created from your Ad Hoc production certificate, along with your production provisioning profile. Save that. You should now be able to download the app to your device and send a push notification. If everything works and you want to submit to the app store, just rebuild on PhoneGap Build with an app store signing key, and submit. First, you must be on a real device, not in an emulator to test notifications. Second, you always have to use an explicit app ID, not a wildcard app ID. If you are using Phonegap Build, you must use an explicit app ID, production certificate, and ad hoc provisioning profile to test push. You cannot use a development certificate to test. Some push notifications providers have a sandbox mode that you can use to test, follow their provided instructions if that is the case. If something still isn't working right, the only thing you can really do is delete everything and start over. Hopefully you won't have to do that, here are some tips to keep you out of trouble. Don't mix someone else's certs or profiles with your own. Make everything on your machine at the same time. All certs and profiles have to match up, all development or all production/distribution, and all for the same app ID. Make sure you are a registered developer on the account, it won't work if you're not. Certs only last for one year. Your apps won't stop working when they expire, but you'll need to create new ones if you want to make new apps or resubmit. Hopefully that helps you submit your app to Apple without too many forehead bleeds from banging your head against your desk. Further documentation can be found in the PhoneGap Build documentation.